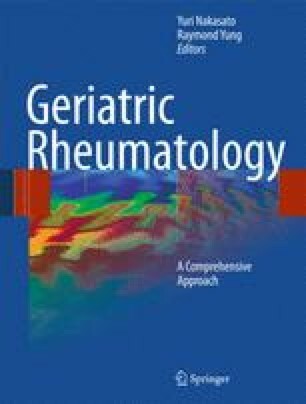 Rheumatic diseases and their resultant musculoskeletal and cardiopulmonary impairments are primary conditions limiting activity and function in older adults. Certain rheumatologic conditions such as polymyalgia rheumatica, degenerative spinal stenosis, and osteoporosis occur later in life. Other conditions such as rheumatoid arthritis, osteoarthritis (OA), and ankylosing spondylitis manifest at younger ages but their clinical manifestations may exacerbate with advancing age and concomitant changes in the musculoskeletal and sensory–motor systems, and with the coexistence of multiple comorbidities and polypharmacy. In fact, studies (Dunlop et al., Arthritis Rheum 44:212–221, 2001; Covinsky et al., J Am Geriatr Soc 56:23–28, 2008) indicate that older adults with arthritis are more limited in mobility and activities of daily living. Physical therapy interventions focus on restoration, maintenance, and promotion of maximal physical function (American Physical Therapy Association, Guide to physical therapist practice, 2003). The physical therapy model of practice is based on the International Classification of Function (ICF) [World Health Organization, International Classification of Functioning, Disability, and Health (ICF): ICF full version, 2001] and addresses patients’ needs at multiple levels across a continuum of care (Fig. 12.1). Physical therapy interventions for older adults with rheumatologic conditions aim to reduce pain; increase and maximize joint mobility; muscle strength; flexibility; aerobic capacity and to prevent functional loss. Interventions consist of exercise, physical modalities (e.g. heat, cold), skilled techniques such as joint mobilization/manipulation, and use of orthotics and assistive devices, combined with patient education. This chapter discusses the physical therapy management of six rheumatic conditions: polymyalgia rheumatica, spinal stenosis, osteoporosis, rheumatoid arthritis, OA, and ankylosing spondylitis. The National Osteoporosis Foundation website. http://www.nof.org. Accessed 30 Apr 2008.